This website is intended to recall the experience of American military families living in Frankfurt, Germany, in the late 1950s and early 1960s. Of course everybody is welcome here, but no special pains have been taken to explain things to a wider audience. Latest update: 4 September 2017 (see bottom). The bomb is on Wismarer Straße, right across Siolistraße from our high school, where the Ambassador Arms and generals' housing used to be [SEE MAP]. It's a 4000-pound "blockbuster"; FHS would be in the crater if it exploded, Teen Club too, and everything else in the area. —Deutsche Welle, Wednesday, August 30, 2017. Frankfurt WW2 bomb: Mass evacuation completed, BBC News, September 3, 2017. A NY Times article (same day) refers to the area as a "well-to-do district that is home to some of Frankfurt's banking elite, as well as Germany's central bank". The construction that unearthed the bomb was faculty housing for Goethe University, which we remember as the I.G. Farben building or the Abrams Complex. Frankfurt WW2 bomb defused after mass evacuation (BBC News, September 3, 2017). On a trip to Germany in 1975, I swung by the old neighboorhood and took a few (too few!) pictures of Frankfurt High School and the nearby area. Little had changed since I lived and went to school there in 1959-61 (although Stadt Frankfurt itself was in the process of being torn down and replaced with a whole new one). (*) Most of the commentary is on this page. I'm truly appalled at how few pictures I took when I lived in Germany. Except of castles and such, which are all still there. The everyday landscape of our lives is gone forever, no do-overs. In June 2005 I came by 23 color slides taken by my father in 1959-61, CLICK HERE TO SEE THEM. And in September 2005 Beni Calchera sent 16 color photos of the Ginnheim area of Frankfurt as it is today, including some comparisons with the older photos from 1959-61. CLICK HERE TO VIEW. 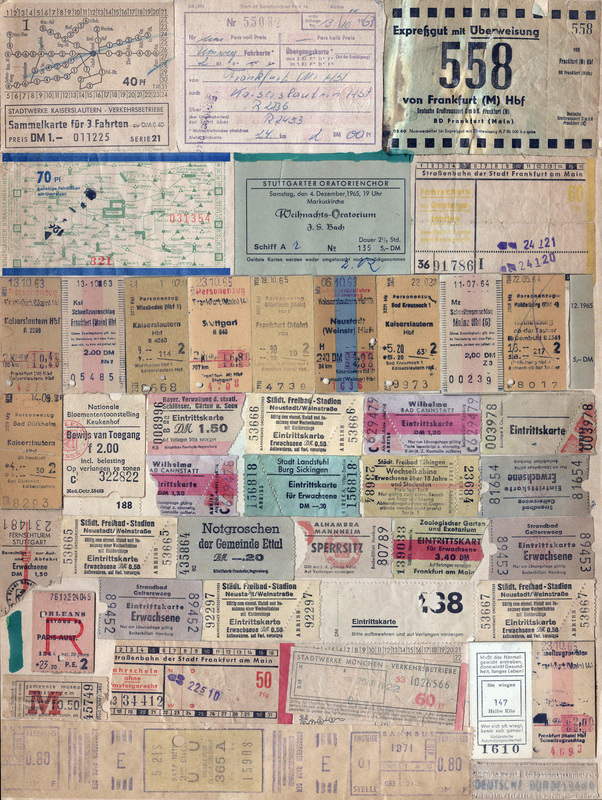 Train, trolly, and other tickets: Frankfurt, Offenbach, Höchst, Wiesbaden, Kaiserslautern, Stuttgart, Bad Dürkheim, Rothenburg, Neustadt, Bad Cannstatt, Bad Kreuznach, Mannheim, Heidelberg, Mainz, Tübingen, Landstuhl, Ettal, München, Amsterdam, Paris, Orleans. Gelterswoog was a swimming hole in Hohenecken near Kaiserslautern. I don't remember making this thing, but it must have been me, who else has been to all those same places? Click here to see a 1k×1.3k pixel image (0.8MB); click here to see a medium (2k×2.6k) image (3MB); or click here to see a large (3.5k×4.6k) image (8MB). Other Links: See Image 1.